You have seen variations of this salad here before, but it's that time of year when I make a lot of quinoa salads with roasted anything. 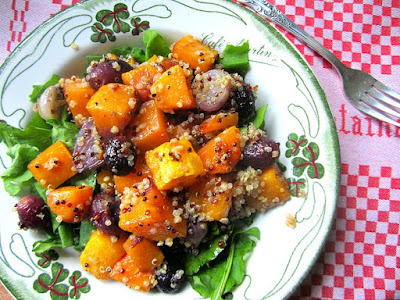 Here, I paired quinoa with roasted cubed butternut squash, baby red onions (they are so cute), and roasted grapes. Everything roasted on a sheet pan in a 400F oven for 25 minutes (the usual: drizzled with olive oil and kosher salt). Make a dressing of some olive oil, white balsamic vinegar, and a tsp of honey. Salt and pepper. That's it. 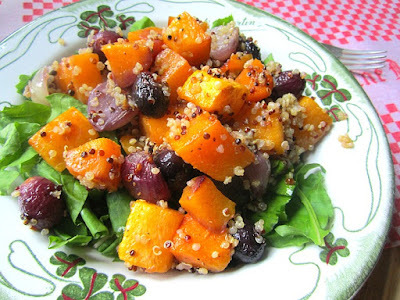 Mix the salad and serve on a bed of arugula. I have added in pistachios and pecans to make a heartier salad. 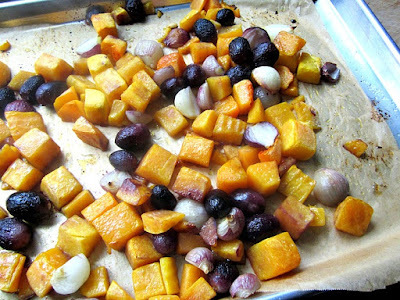 This is also a great Thanksgiving side dish. I’m contacting you today to inquire about the possibility of publishing an editorial article on your website. One of our partners is currently looking for good quality sites and http://www.staceysnacksonline.com/ matches our requirements. Essentially, I would like to provide you with a quality editorial article that will be engaging for readers and include a natural, contextual link to a partner website. Please get in contact with me if this opportunity is at all interesting for you and your business.